Update: The U.K. got a little Nintendo attention today, too. 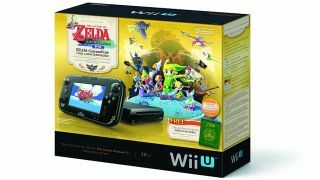 According to Eurogamer, Nintendo outed details of its Legend of Zelda: Wind Waker HD Wii U bundle. The bundle is due Oct. 4, and the game will be available with a limited edition Ganondorf figurine then too. Gamers there will also have a mini-game collection Wii Party U on Oct. 25, which will be bunched with a Wii Remote Plus in either white or black. Gamers may be turning their backs on the Wii U, but Nintendo plans to staunchly defend its next-gen console against invading competitors this holiday season with a drop in price. Nintendo today confirmed a change in suggested retail price for the Wii U, which comes on the eve of new threats from both Sony's PS4 as well as Microsoft's Xbox One. Beginning Sept. 20, the Wii U Deluxe drops from $349.99 (about UK£225, AU$391) to $299.99 (about UK£193, AU$335), a $50 price cut that Nintendo executives hope will make the troubled console more affordable; no official announcement has been made yet regarding a similar change in Europe or Japan. The same price will also apply to a new deluxe bundle that includes digital copies of The Legend of Zelda: The Wind Walker HD as well as the Hyrule Historia book coupled with a Zelda-themed GamePad and a 32GB hard drive. Rumors of a Wii U price cut have circulated for months, but Nintendo's announcement colors the decision as just business as usual. "The price decline is pretty straightforward. Really, the focus on heightening the value for Wii U is now that we are in a position where we've got a regular pace of great software," Nintendo of America President Reggie Fils-Aime told IGN. Fils-Aime specifically cited this month's arrival of Pikmin 3 and New Super Luigi U as well as Wonderful 101 and Wind Walker HD next month as Nintendo's "strong pace of first-party, strong third-party content." According to USA Today, the current 8GB Wii U Basic model will no longer be manufactured, making room for the lower-priced version such as the original bundle with Nintendoland.